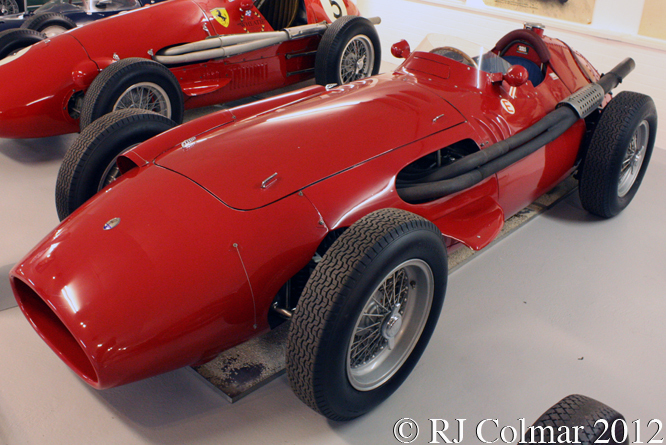 Today’s featured Maserati 250F chassis #2515 made it’s debut for the works team in the 1955 Argentinian GP where it retired with engine failure after Sergio Mantovani, Jean Behra and Luigi Musso had completed 54 of the scheduled 96 laps. 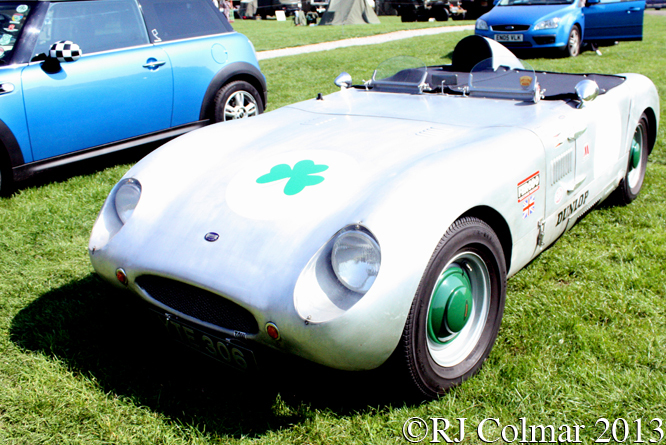 Roberto Mieres, Peter Collins, Stirling Moss and Carroll Shelby all drove #2515 in 1955 with Stirling Moss recording the best result with a win in the non Championship Gold Cup at Oulton Park. Francisco Landi and Gerino Gerini shared the car in the 1956 Argentine Grand Prix to score a season high 4th. After Francisco finished 7th in the Brazilian Grand Prix ownership of #2515 appears to have been passed over to Scuderia Guastalla in Italy. Gerino and Umberto Maglioli drove the car on two occasions each over the remainder of the 1956 season with Gerino’s 5th place finish in Syracusse being the best result. Ottorino Volonterio acquired the car after it had been rebodied for the 1957 season and it was entered in three events with the best, only, finish being 11th in the Italian Grand Prix where Ottorino shared the driving with André Simon. André Testut failed to qualify the car for the 1958 Monaco Grand Prix, as he would his own 250F #2521 in the same event the following season. From June to September 1958 #2515 was entered in four events by Scuderia Centro Sud with Maurice Trintignant finishing seventh in the Belgian Grand Prix at Spa. 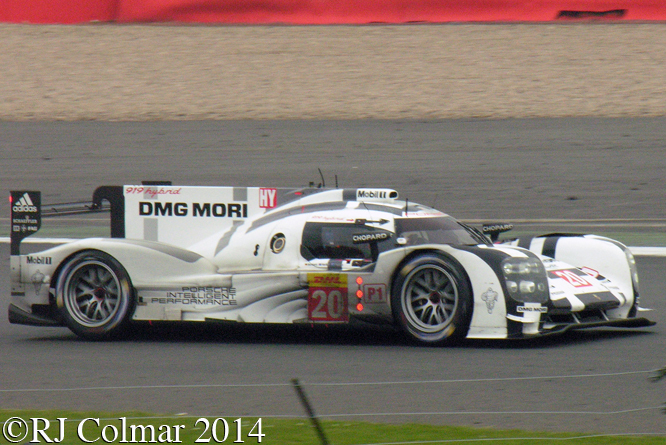 Gerino drove in the remaining three recording a best 6th place finish at Caen. Hans Hermann drove #2515, now entered by Joakim Bonnier, in the 1958 Italian Grand Prix from which he retired with a valve issue. 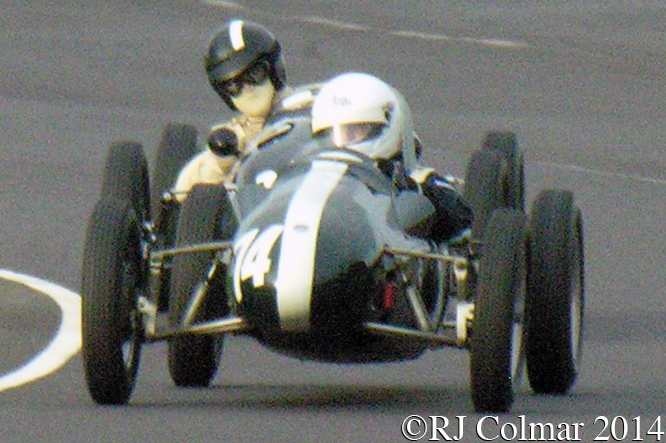 In 1959 Fritz d’Orey retired #2515, now entered by Scuderia Centro Sud again, from the British Grand Prix. The final known appearance of #2515 was in the 1959 Italian Grand Prix where Giulio Cabianca driving for Ottorino Volonterio finished 15th. 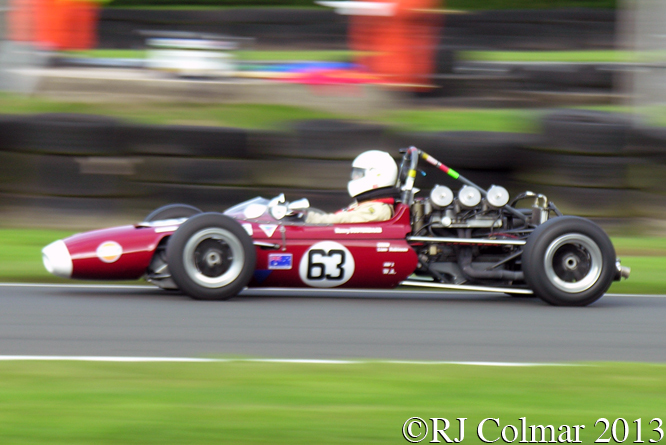 Tom Wheatcroft bought #2515 in 1965 and it is seen in this picture in the Donington Grand Prix Collection which he founded. Thanks for joining me on this “Gold Cup Winner” edition of “Gettin’ a li’l psycho on tyres” I hope you will join me again tomorrow when I’ll be looking at a Delahaye. Don’t forget to come back now ! 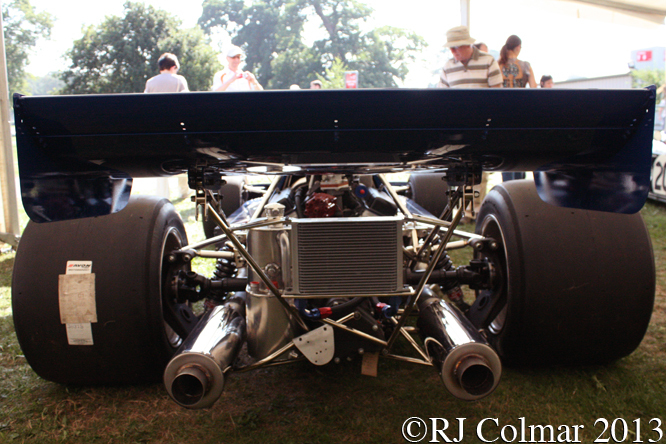 This entry was posted in Uncategorized and tagged 250F, Behra, Bonnier, Cabianca, Collins, Colmar, d'Orey, Donington Grand Prix Collection, Formula One, Gerini, Gold Cup, Hermann, Landi, Maglioli, Mantovani, maserati, Mieres, Moss, Musso, Psychoontyres, Ralph, Scuderia Centro Sud, Scuderia Guastalla, Shelby, Simon, Testut, Trintignant, Volonterio, Wheatcroft on November 10, 2014 by Ralph. 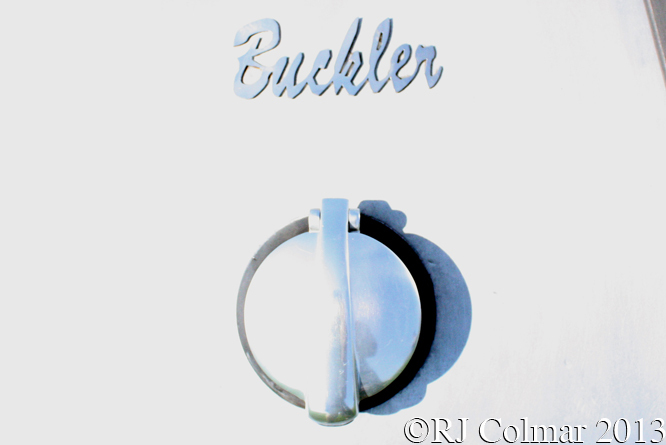 From 1953 to at least 1959 a number of Buckler Mk 90’s were manufactured. From the Buckler Register it would appear all were fitted with 1172 cc / 71 cui Ford side valve motors as fitted to numerous Fords including the contemporaneous Ford 100E Prefects and Anglia’s. 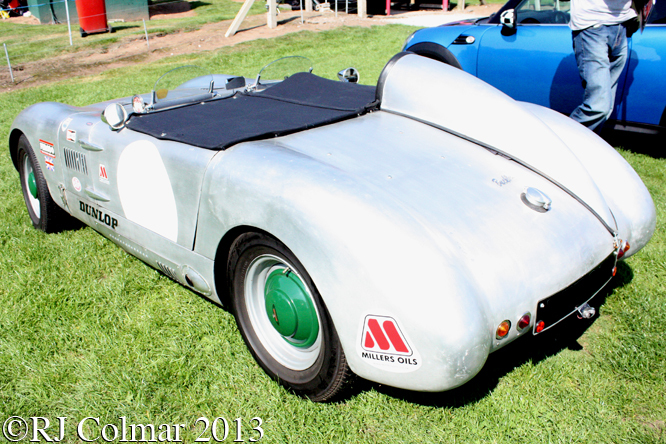 Elsewhere it would appear the body of the Mk 90 was designed by New Zealander Ferris de Joux, although I suspect Ferris may have designed a fiber glass body for at least one Buckler raced in New Zealand, most of the known Buckler Mk 90’s, including the 1956 example featured to day seen at Oulton Park, were fitted with aluminium bodies which leads me to question de Joux’s involvement with the Mk 90 bodies seen in the UK. If you know that de Joux’s design made it beyond New Zealand for the UK aluminium bodied cars please do not hesitate to chime in below. Of the seven races known to racingsportscars in which Buckler Mk 90’s were driven, two of them were won by a Mk 90 with N. Grier-Rees at the wheel including the 1957 Silverstone Relay Race. Thanks for joining me on this “Kiwi Body ?” edition of “Gettin’ a li’l psycho on tyres” I hope you will join me again tomorrow when I’ll be looking at a . Don’t forget to come back now ! 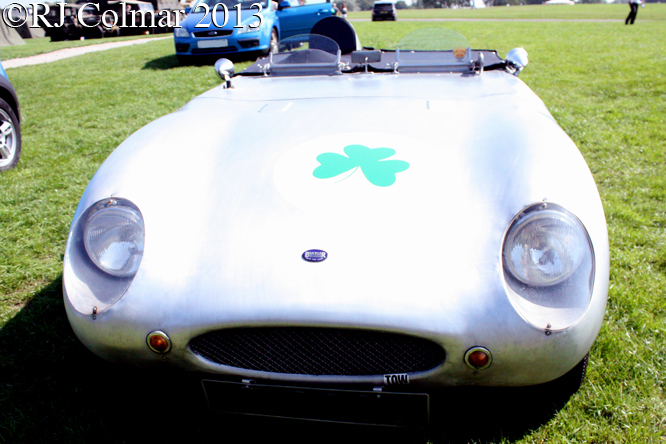 This entry was posted in Uncategorized and tagged 1172, Buckler Mk 90, Colmar, de Joux, Ford, GALPOT, Gold Cup, Ralph, Sports Racing Car on March 15, 2014 by Ralph. 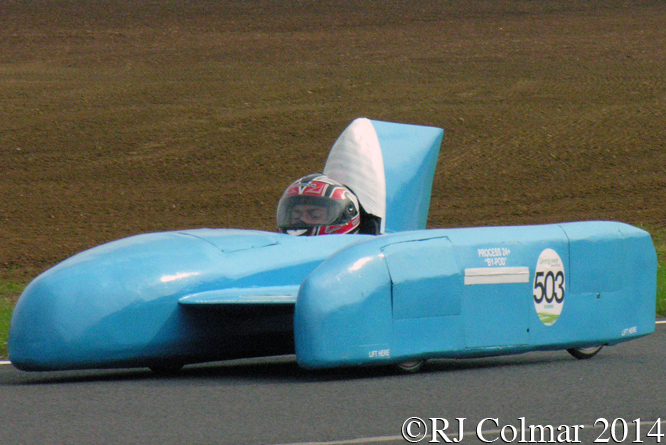 Having developed a passion for engineering through his interest in model aeroplanes Lancastrian Derek Bennett took an apprenticeship in mechanical and electrical engineering to become a mechanic, during this time he was exposed to (British) Stock Car racing. It was not long before Derek graduated into building, maintaining and racing vehicles in the British Clubmans series for small Ford powered vehicles and into Formula Junior. In 1965 demand for copies of his Clubmans racer led Derek to establish Chevron cars assisted by mechanic Paul Owen based in a former mill in Bolton, well away from the regular stomping ground for racing car manufactured that with few excetions could be found in the arc from Southwest London, round Brooklands and Heathrow Airport to the East and Silverstone to the North. 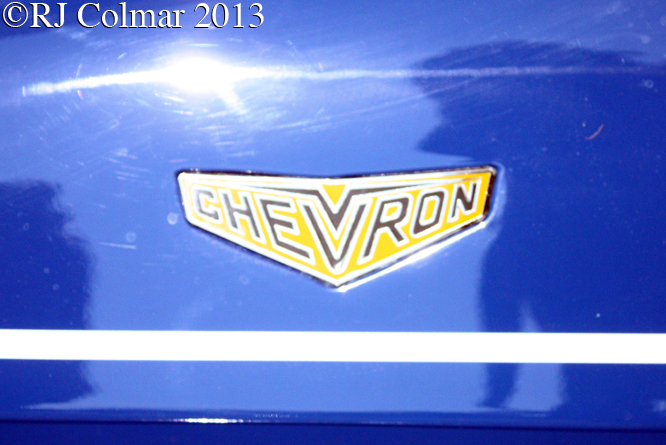 In 1966 Chevron branched out into building a successful series of up to 2 litre / 122 cui sports cars and in 1967 the company expanded to build it’s first 2nd and 3rd tier open wheelers for Formula 2 and Formula 3. 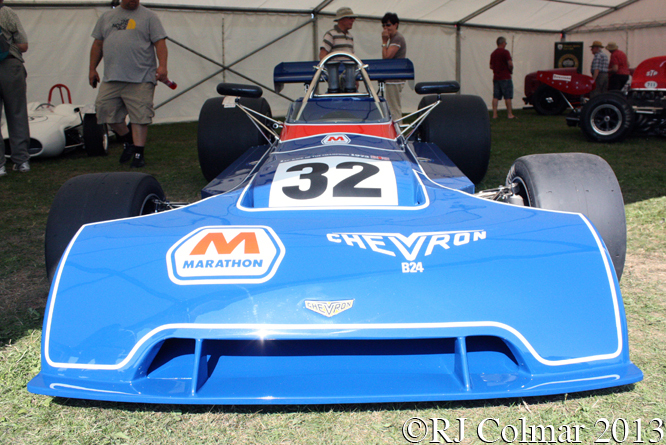 In 1972 Chevron built it’s first over 2 litre 122 cui open wheeler the 5 litre / 302 cui stock block Chevrolet V8 powered Formula 5000 Chevron B24 which Lancastrian Brian Redman drove in four races, claiming one victory at Oulton Park driving the B24 having won the previous race at Mondello Park a month earlier in a McLaren M10. Today’s featured car #B24-73-02 was the second built in 1973, third overall from 8 built according to factory records, though as usual this does not tell the whole story, but I’ll be spare you that particular diversion here. 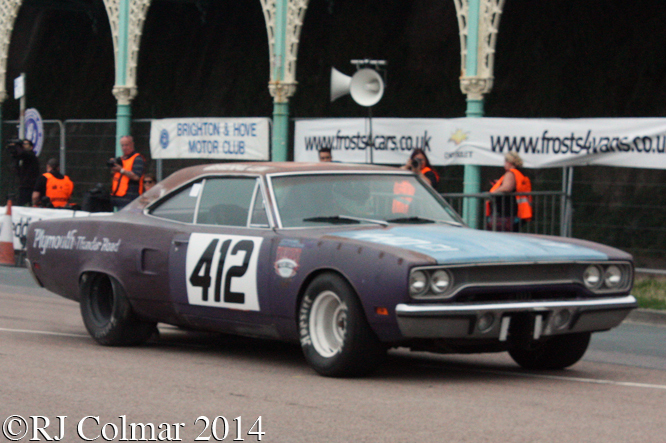 #B24-73-02 appears to have been entered on three occasions carrying the #32 in British races as a factory entered car for Peter Gethin. 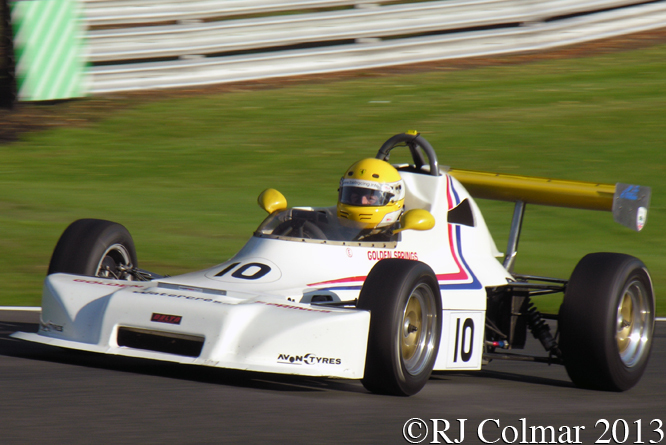 The first two races held on consecutive days were at Brands Hatch where Peter won the Rothmans Formula 5000 championship round on the cars debut. 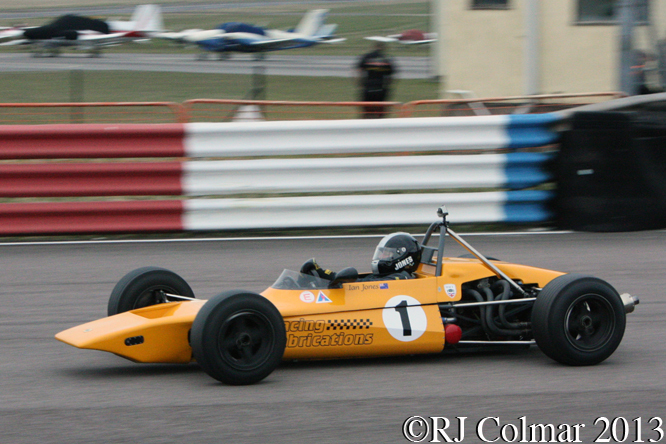 The next day the weekends feature event, The Race Of Champions, was a race for contemporary Formula 5000 cars and Formula One cars including entries from Lotus, BRM and McLaren all of whom had won championship Formula One events in the previous 12 months. 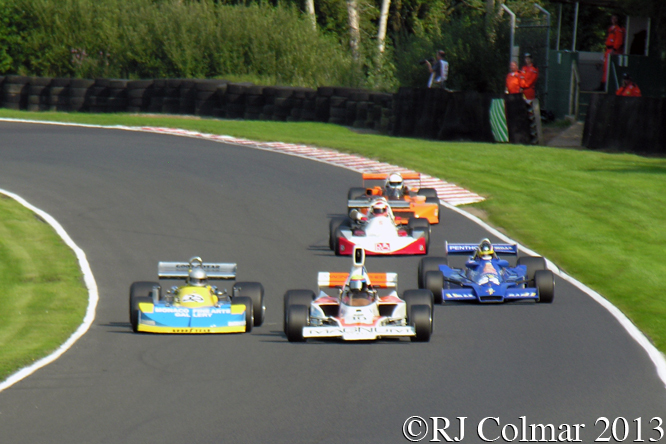 Starting 8th on the grid Peter managed to steer his Formula 5000 stock block Chevron to an unlikely victory as his faster Formula One rivals fell by the way side to hold off Denny Hulme in the latest McLaren Cosworth M23 and formula one debutant James Hunt in an ancient Surtees TS9. 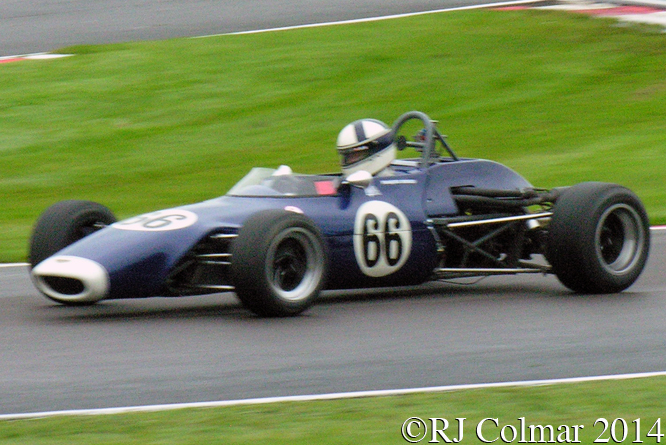 There is a myth that this was the only occasion in which a Formula 5000 car beat a Formula One car in such a non championship challenge race, this is not quite true there was a long forgotten event called the 1969 the Madrid Grand Prix at Jarama in which Tony Dean driving BRM #P2615 powered by a V12 BRM was beaten by Keith Holland driving an F5000 Lola T142 and Peter Gethin driving an F5000 MacLaren M10A, but the field at Brands in 1973 was certainly more contemporary and competitive. 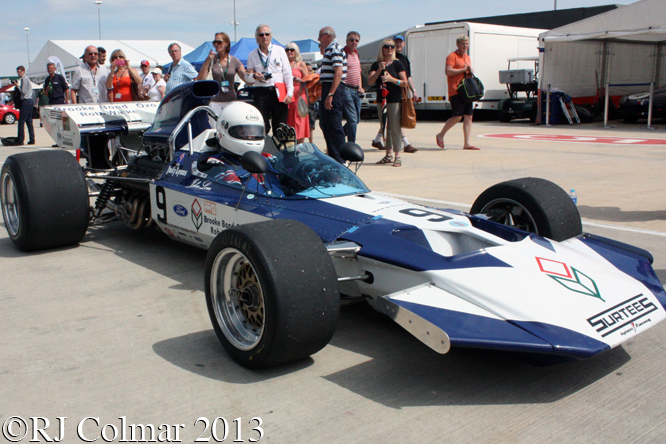 Chevron then entered Peter for one more British F5000 race at Mallory Park where Peter finished forth before the car was sold to Douglas Shierson Racing who entered the car carrying the same Marathon sponsorship for Peter in the US L&M series now running the #8 race number. 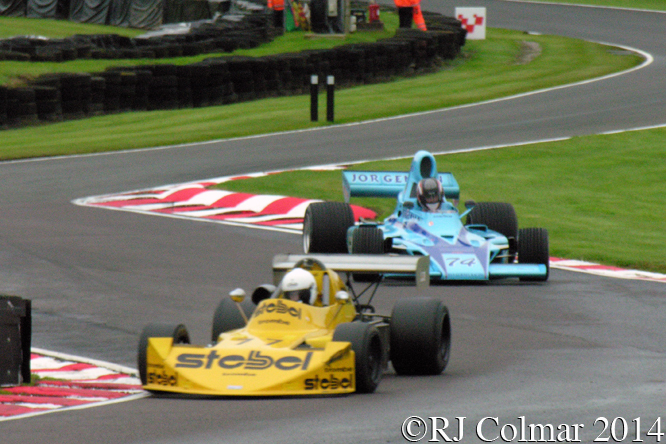 The B24 did not prove quite so competitive in the 1973 US series where only championship protagonists Brian Redman driving a Lola T330 and Jody Scheckter a Trojan T101 found victory lane. 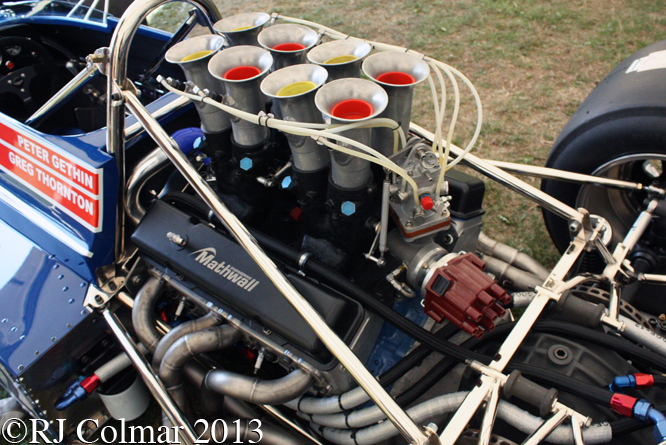 Peters best result came at Lagunna Seca where finished second. 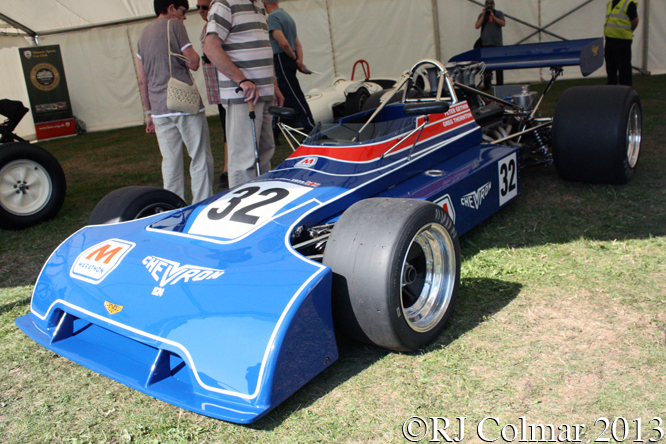 After 1973 #B24-73-02 remained in the USA where, Roger Bighouse 1974 /1975, Pat McGonegle 1976 continued to enter the car in open wheel F5000 events. 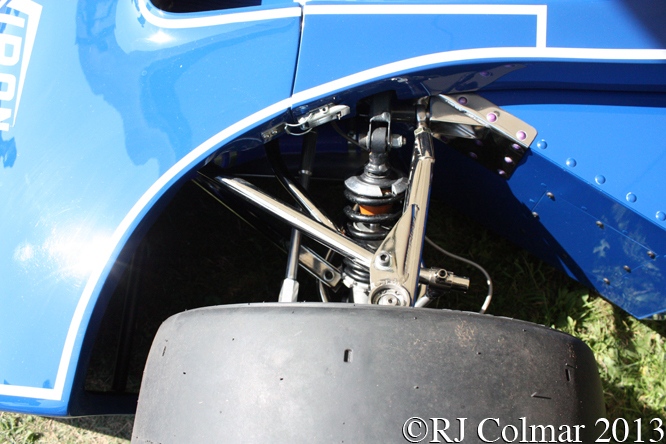 For 1977 Pat McGonegle converted the car to closed wheel CAN Am 2 spec, scoring a best 6th place finish at Road America in ’77 driving #B24-73-02 which Pat raced until the end of 1978. Danny Johnson was the next owner and he raced #B24-73-02 sporadically between 1978 and 1982 scoring a best 5th place at Edmonton in 1981. Similarly intermittently Mike Engstrand drove #B24-73-02 from 1985 to 1987 scoring a best 4th place finish in the cars last in period appearance in the 1987 Canadian American Thundercars Pueblo event. 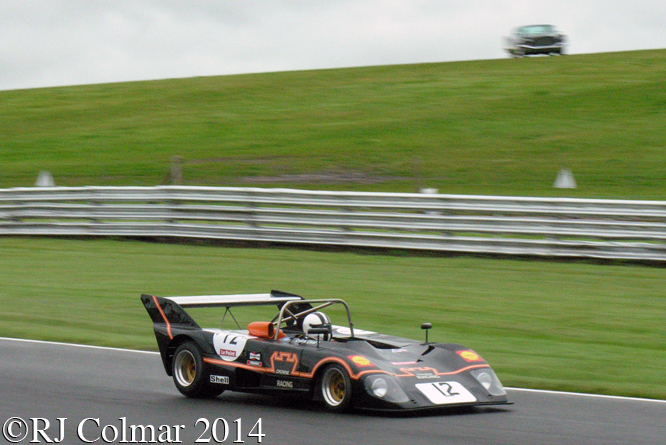 #B24-73-02 now belongs to Greg Thornton. 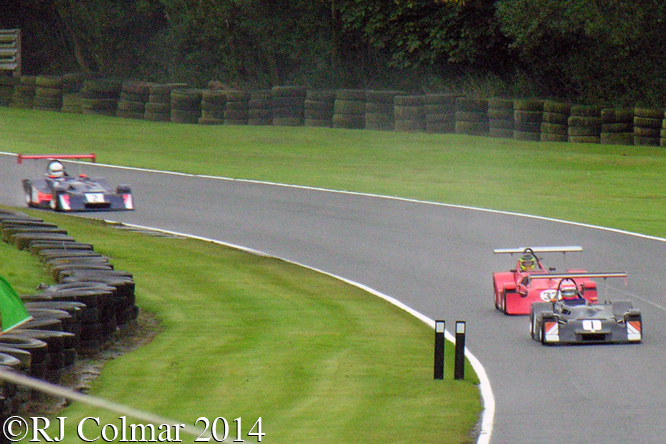 In 2012 the car caught fire and was badly damaged and it is seen here at Oulton Park after it’s rebuild from the fire damaged remains. Thanks for joining me on this “Giant Killer” edition of “Gettin’ a li’l more psycho on tyres” I hope you will join me again tomorrow for a look at a another Italian vehicle once owned by John Lennon. Don’t forget to come back now ! 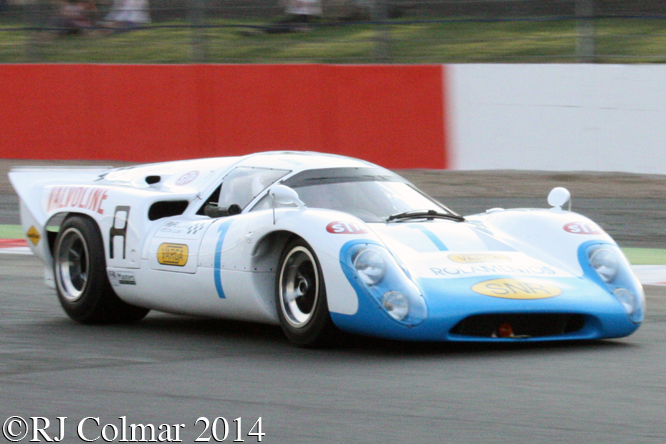 This entry was posted in Uncategorized and tagged B24, Bennett, Bighouse, Boulton, Brands Hatch, Chevrolet, Chevron, Colmar, Engstrand, Formula 5000, GALPOT, Gethin, Gold Cup, Johnson, McGonegle, Oulton Park, Owen, Race of Champions, Racing Car, Ralph, Redman, Thornton on December 21, 2013 by Ralph. 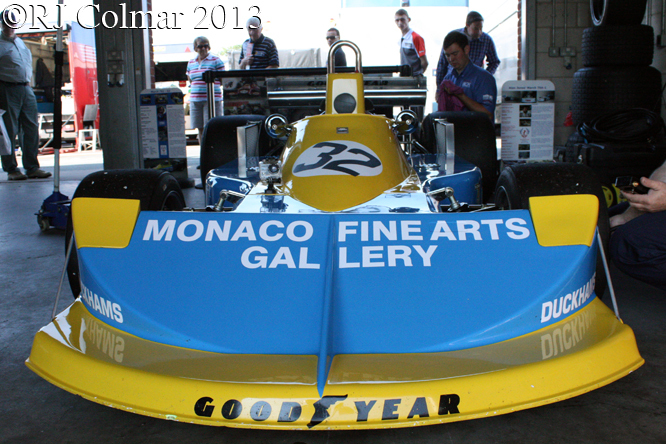 Being a racing fan who once attempted to give his FIAT 128 a Ferrari 312T2 paint job before thinking better of it, I have always admired those who managed to paint their road vehicles with convincing racing colour schemes. 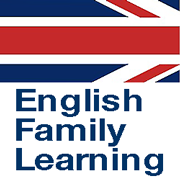 This months Saturday blogs will be a tribute to those who persevered where I gave up. 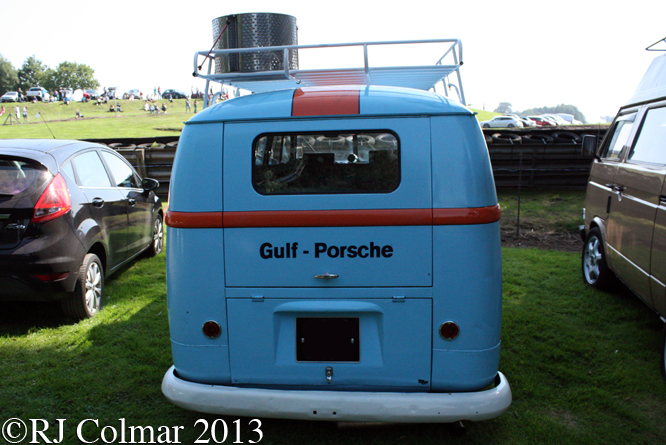 I particularly liked the Gulf Oils paint job on this 1957 Volkswagen Type 2 (T1) because the names of works Gulf Porsche drivers Jo “Seppi” Siffert and Brian Redman appear just above the door handle. 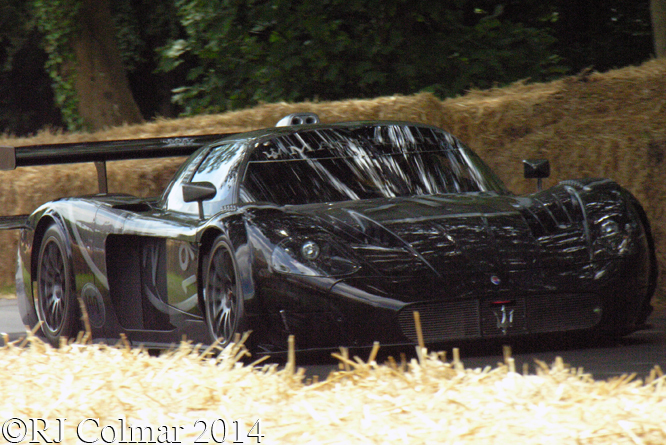 Not sure why this vehicle is carrying what appears to be a washing machine drum on the roof while it is parked up at Oulton Park for the Gold Cup, but if you have any amusing idea’s please do not hesitate to chime in below. 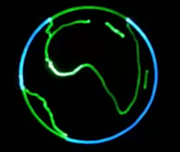 Thanks for joining me on this “Jo & Brian” edition of “Gettin’ a li’l psycho on tyres” I hope you will join me again tomorrow when I’ll be looking at an early Williams Grand Prix car. Don’t forget to come back now ! 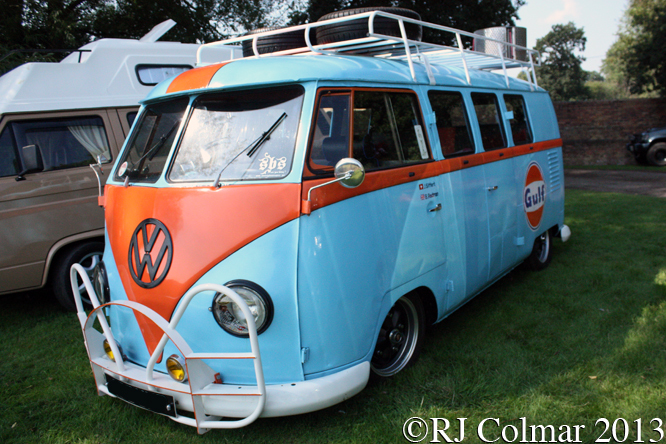 This entry was posted in Uncategorized and tagged Camper, Colmar, GALPOT, Gold Cup, Oulton Park, Ralph, Redman, Siffert, T1, Transporter, Type 2, Van, Volkswagen, VW on November 2, 2013 by Ralph. 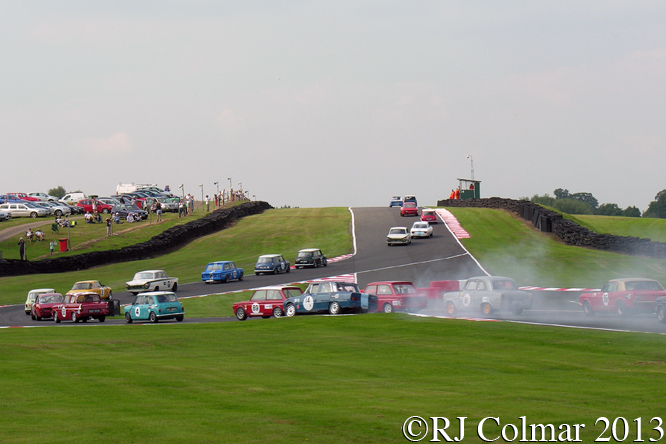 On Bank Holiday Monday a couple of weeks ago I picked up GALPOT contributor Tim Murray and headed 175 miles north to Oulton Park for the second day of the Gold Cup meeting which marked the circuits 60th Anniversay. When we got there we met friends Simon and Phil from The Nostalgia Forum who directed us toward the control Tower where Steve Jones invited us to a cup of coffee and we met Alan Cox who also puts in a regular appearance on these pages. 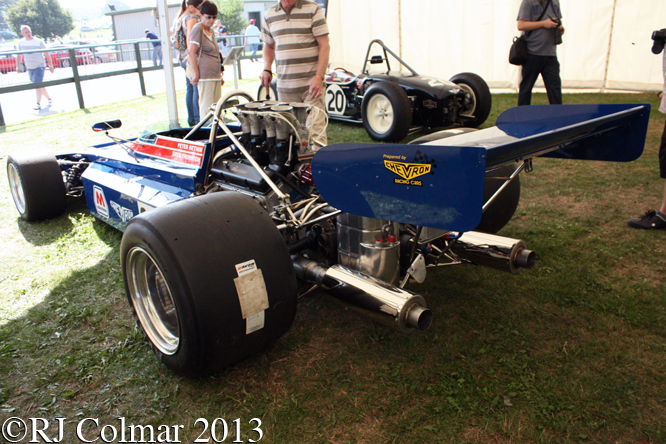 Afterwards Tim and I had a wonder around the paddock where we found Greg Thornton’s Formula One March 761 resplendent in the colours of Sweden as would have been seen in the hands of Ronnie Peterson. 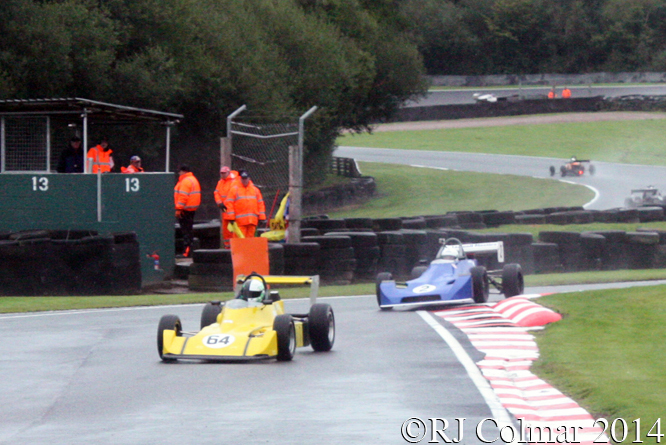 Greg was declared the winner of the opening Derek Bell Trophy race of the day after Micheal Lyons experienced a pinion failure in his Lola T400 Formula 5000 car and an accident in which no one was hurt blocked the track. 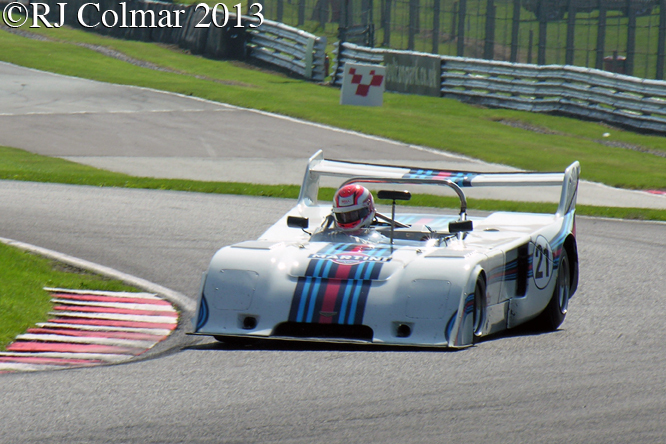 Despite a sagging rear wing James Dodd driving his, non period, Martini liveried 1976 Chevron B36 appropriately won the Martini Trophy for 2 litre / 122 cui sports cars. 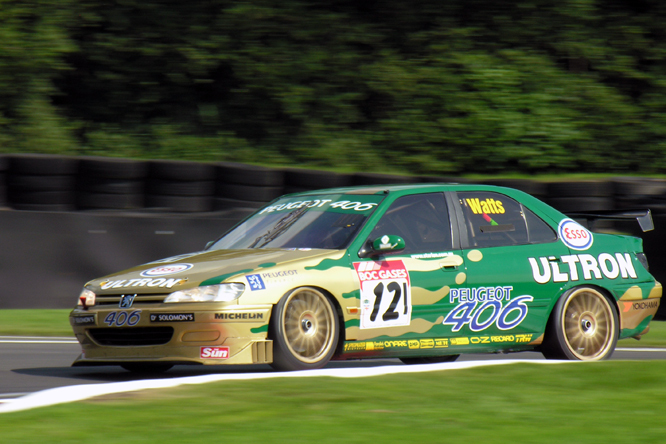 I only ever saw Patrick Watts 1998 British Touring Car Championship Peugeot 406 racing on the television but I spent many hundreds of happy hours driving one just like it in a Play Station game called TOCA 2, Patrick found his old car in Australia. 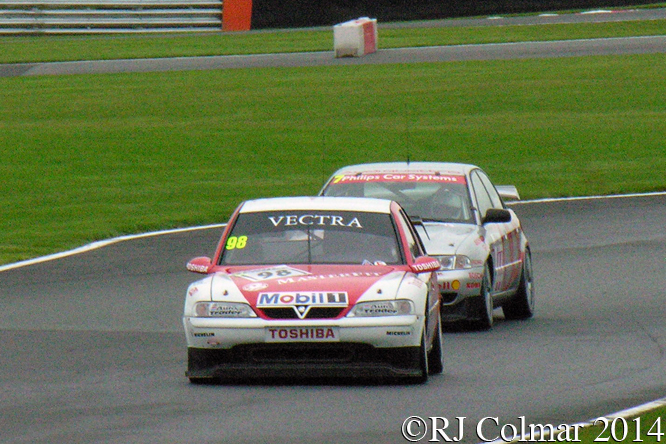 Unfortunately he did not finish the Super Touring Trophy which was won by the versatile James Dodd who didn’t have time to celebrate his Martini Trophy win in the Chevron B36 before jumping into his Honda Accord. 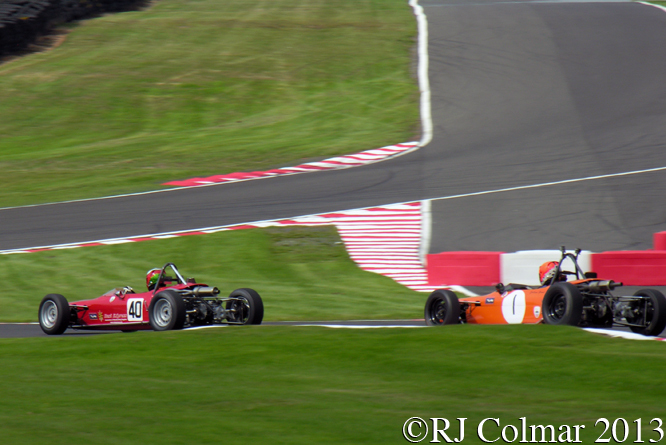 The Historic Formula Fords can always be relied on to provide entertaining racing, Sam Mitchell and Callum Grant in their #40 and #1 Merlyn MK 20’s were never much further apart than this through out the 20 min race. 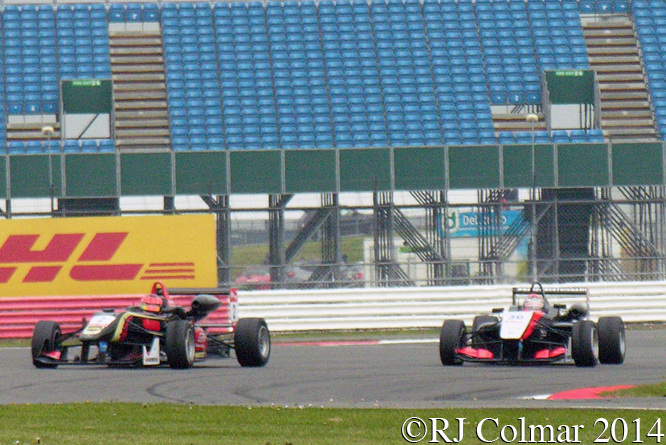 Callum eventually got the better of Sam to take the chequered flag. 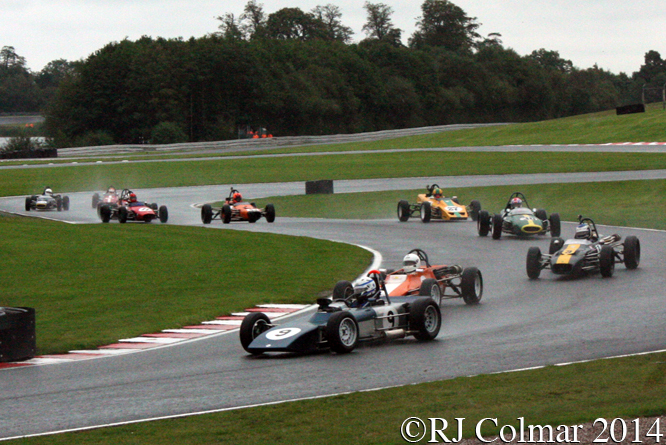 Nelson Rowe won the Amitstead Barnett Financial Services Formula Ford 2000 race and sowed up the Historic Formula Ford 2000 championship with a fine win in his Reynard SF79, the #10 Delta T81 of Derek Smith above has a chassis design going back to 1978 which was penned by none other than Patrick Head went on to form a formidable partnership with Frank Williams. 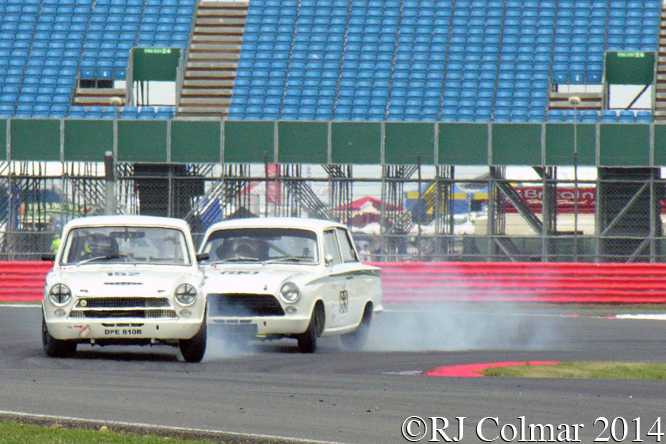 The Historic Touring Cars also provided a hugely entertaining spectacle above the #14 Alfa Romeo Giulia Super of Bob Schukburgh takes the bumpy route as he tries to pass a couple Hillman Imps, the #4 Mini was driven by British Olympic Cycling legend Sir Chris Hoy. 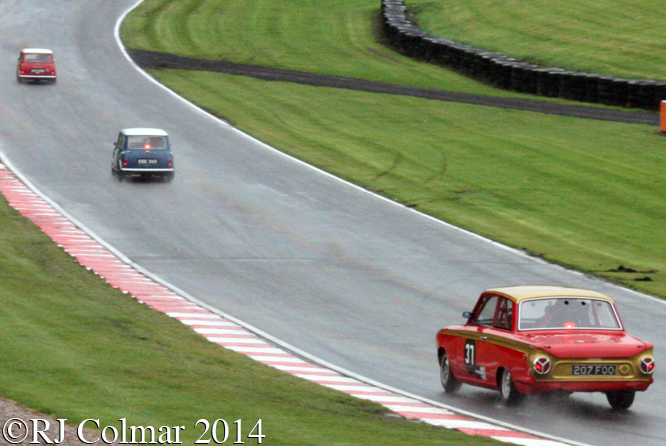 Richard Dutton in the red and gold #35 Ford Mustang worked his way up from the back of the grid to 5th place in the race which was won by Mark Jones in a Ford Lotus Cortina. 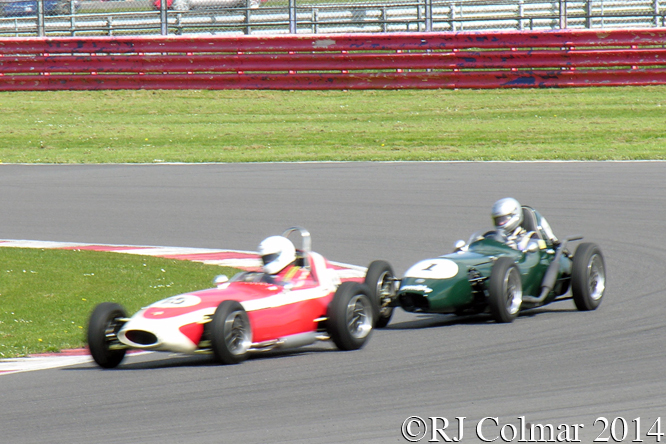 A welcome Antipodean novelty in the Libre race for Classic Racing Cars was the Alton AR2 powered by a Holden straight six driven by Henry Ooterbaan, the race was won by Andy Jones driving his father Ian’s Lotus 59. 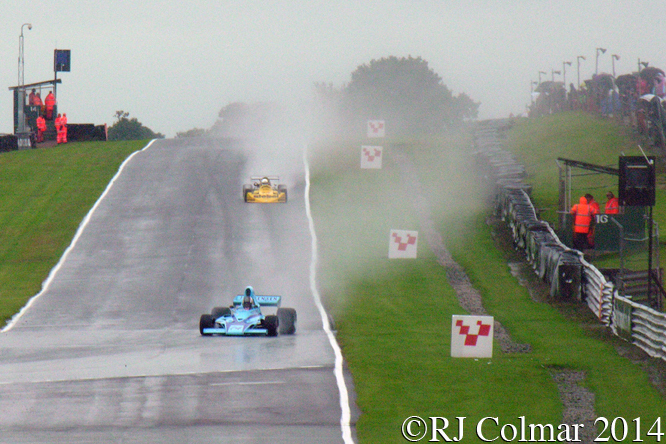 If the first Derek Bell Trophy race disappointed because of it’s premature end, the second made up for it by the bucket load. 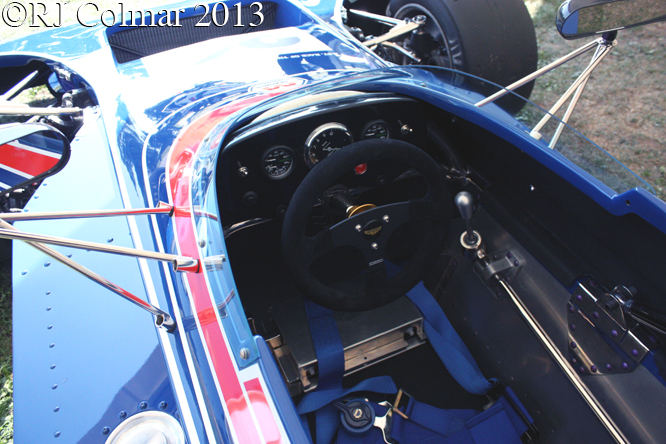 With Micheal Lyons Lola rendered hors d’combat by it’s gearbox Micheal’s father Frank stepped aside to let his son race the family Hesketh 308E with which he started from the back of the grid. For the first 5 laps Neil Glover driving the #10 Lola T300/332 kept Greg Thornton in the #32 March 761 at bay by which time Micheal Lyons joined the fun. Greg on the left is seen above about to over take Neil in the Lola while Micheal on the right is about to pass on the outside on lap six. 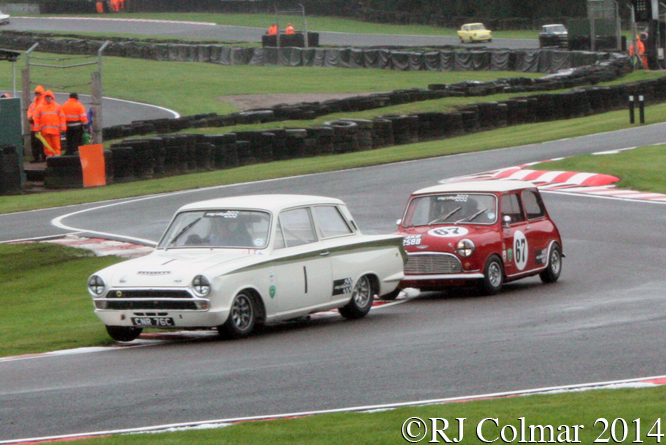 On the following lap Micheal got past Greg to take a comfortable win. 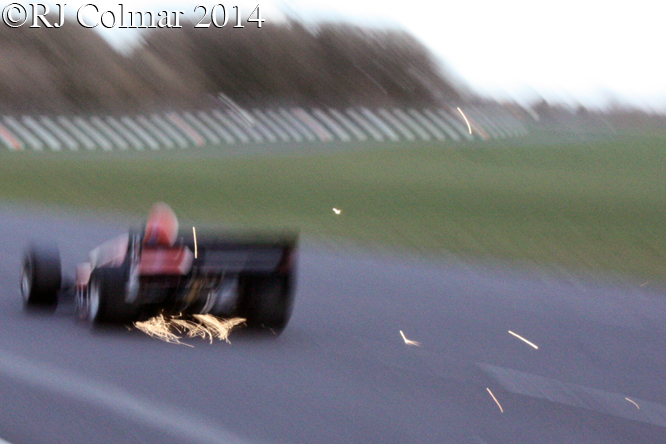 Afterwards I was left wondering what Micheal might have achieved in his Mum Judy’s Surtees TS9. 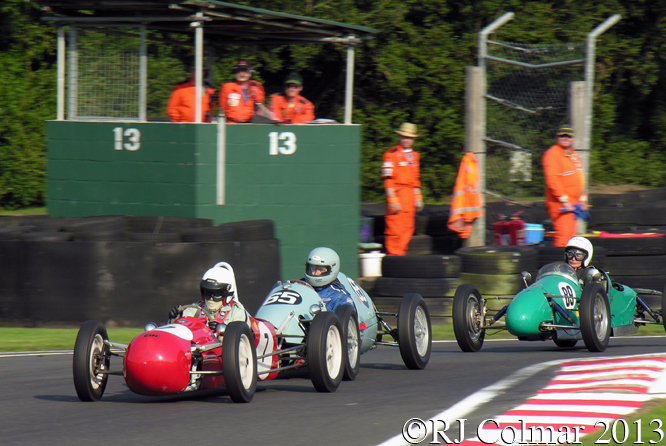 Steve Jones won the 500cc / 30.5 cui Formula 3 race in his Cooper, above the #7 Petty of Nigel Challis leads the #65 Smith Buckler of Richard de la Roche and #89 Cooper Mk 4 of Shirley Monro in the squable for 10th place, Challis finished the race ahead of Monro and de la Roche. 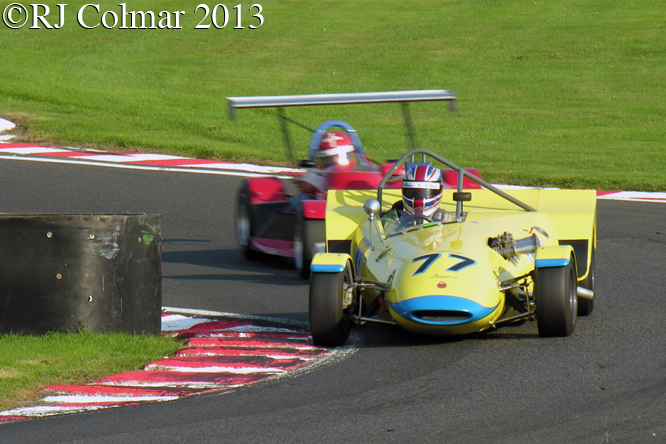 John Harrison led the Classic Clubmans race from lights to flag, above the #77 Ladybird Mk6B driven by Bob Yarwood was built by Oulton Park legend Derek Walker, who is credited with winning more races than anyone else at Oulton Park. Derek received a special award for his achievement during the meeting. 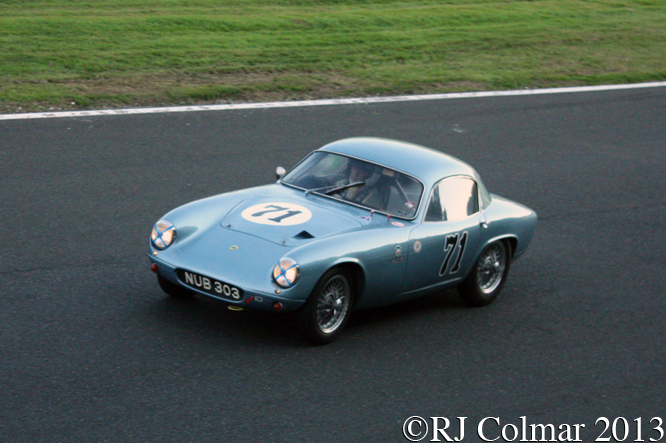 As the sun atarted to set the final race of the day was FISCAR Team Handicap race for sports cars built in the 1950’s was won by Brian Arculus in the #71 Lotus Elite. 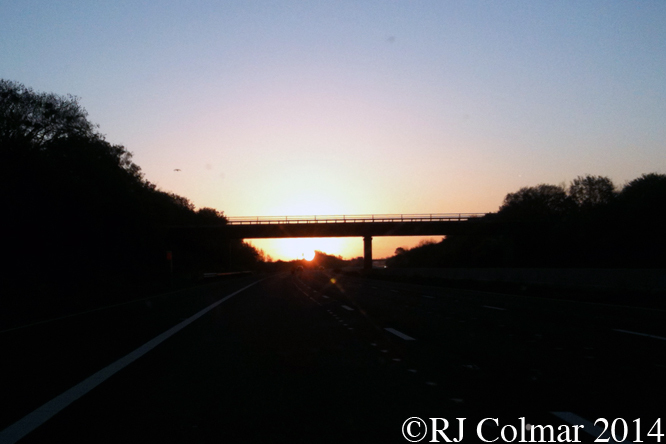 After a quick sausage and chips washed down by a strong cup of tea it was time to head the 175 miles into the evening with the heavy bank holiday weekend traffic listening to Radio 2 which was celebrating the 40th Anniversary of the release of Dark Side Of The Moon. Thanks for joining me on this “60th Anniversary” edition of “Gettin’ a li’l psycho on tyres”, I hope you will join me again for Americana Thursday tomorrow when I’ll be looking at a 1958 racing Corvette. Don’t forget to come back now ! 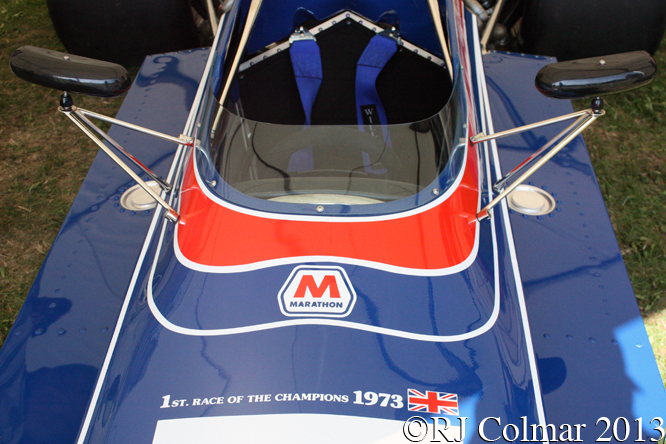 This entry was posted in Uncategorized and tagged Alton Holden AR2, Arculus, Challis, Chevron, Colmar, Cooper, de la Rouche, Delta, Dodd, GALPOT, Glover, Gold Cup, Grant, Hesketh, Historic Touring Cars, Hoy, Ladybird, Lola, Lotus, Lyons, March, Merlyn, Mitchell, Monro, Oulton Park, Petty, Peugeot, Ralph, Smith, Smith Buckler, Thornton, Watts, Yarwood on September 11, 2013 by Ralph.